If you're like most hobbyist anglers, chances are that you think that all fish fillet knife sharpeners are equal. The reality, however, is that no two or three units are made exactly the same. Look closer and you're likely to notice quite a number of glaring differences. And while this gives you a wider variety to choose from, it also makes it harder to settle for the perfect choice. 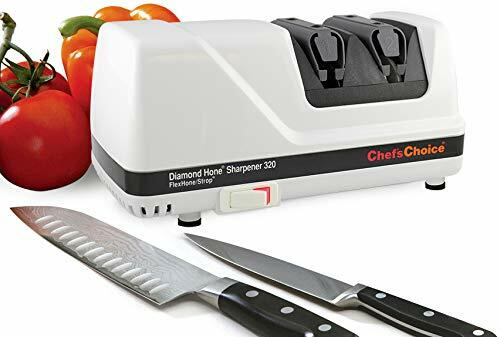 But worry not because, in the following run-down of the best fillet knife sharpener alternatives, we break down everything for you. So, whether you're using a boning knife or spotting the best fillet knife on the market, this comparison chart should have something up for you. Nothing is as frustrating to use as a blunt filleting knife especially when everyone else is eagerly waiting for dinner to be ready. So, don't embarrass yourself, take advantage of the following, comprehensive run-down to up your filleting game. The Presto EverSharp is an electric sharpener that automatically sharpens blades made from alloy, carbon and stainless steel to a razor sharp edge. It is has a sleek design and comes at an affordable price. Using 120 volts, it sharpens non-serrated blades and non-electric serrated knives that are serrated on only one side. The sharpener uses the sharpening systems in professional sharpeners of rapidly rotating Sapphirite grinding wheels. The sharpener has three suction cups for holding it securely on a surface. The sharpening goes through two stages. In stage 1, the blade is ground and sharpened in half of the machine, and then in stage 2, the knife is honed in the second half of the sharpener. Blade guides hold the knives at the ideal sharpening angle. The sharpener is designed with two receptacles for catching metal filings. 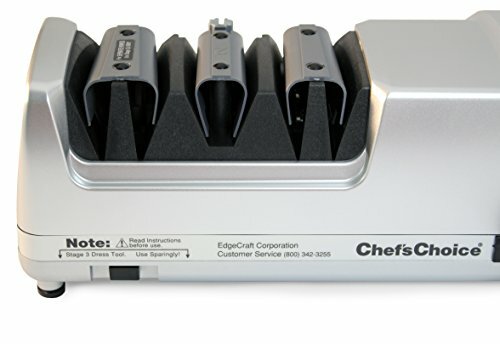 Chef’sChoice 320 electric sharpener is a moderately priced unit that sharpens both serrated knives and straight edged blades to 20-degree class. It is ideal for sharpening household knives, pocket knives, kitchen knives, and some sports knives. It is an easy to maintain unit because it does not require lubrication like other metallic machines. The sharpener is designed with elastomeric feet which hold the sharpener on a surface securely in a stable position. In addition, the sharpener has an elastomeric spring guide that helps to position the blade at the perfect angle for sharpening. The machine uses a two-stage sharpening process to achieve factory results. In stage one, diamond abrasives in the sharpener produce first bevel edge. In stage two the blade is honed using stropping and polishing disks to achieve durable, sharp edges. The knives don’t wear out like when traditional sharpening methods are used. Messermeister CR-12F is a ceramic honing system, unlike traditional hones made of steel. It is suitable for sharpening the vast majority of long knives including Japanese knives. The sharpener is smooth and strong. Because they are smooth, they are not rough on knives. It realigns the knife in addition to sharpening them moderately. Honing is a very effective system of maintaining knives. It preserves their effectiveness and extends sharpening intervals. 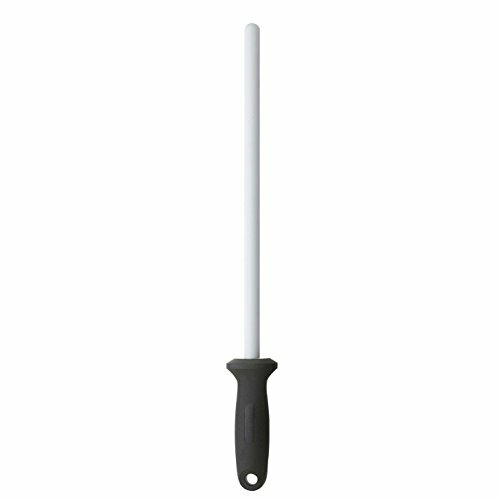 The rod is made from a 1200-grit industrial ceramic. The sharpener comes with an ergonomic handle for easy operation of the unit. You have a choice between two sizes, 10-inches and 12-inches. On the downside, ceramic rods are brittle and can easily shatter into small pieces if you are not careful, or if it drops down accidentally. Therefore be careful with the rod because it is delicate. The tool will not suffice if you need quite a significant amount of metal to be removed from the blade. 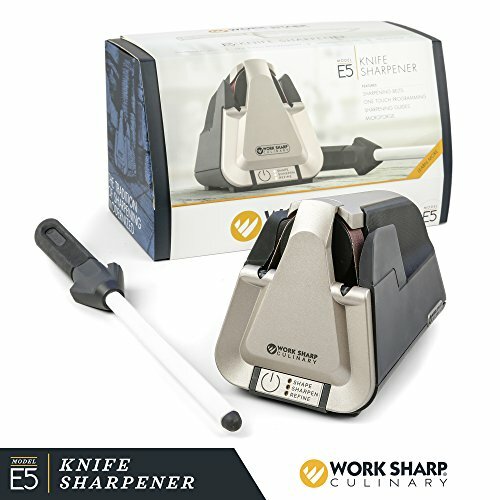 Work Sharp Culinary-E5 is a 2018 award-winning design that employs the sharpening technology of professionals and manufacturers of using flexible sharpening belts to achieve factory-sharp blades. The machine has a built-in guide for right positioning of the blade. 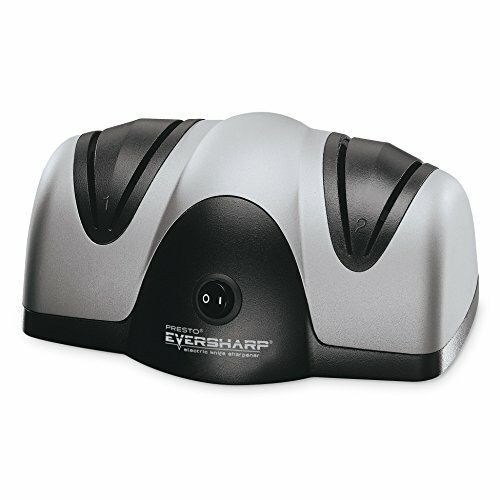 Though this sharpener is very expensive, it is a premium unit that comes with many features. It works with a simple press of the button to shapes the blade, sharpens and hones the blades in a period of 90 seconds. The sharpener is automatic and turns off after sharpening a blade. In addition, it sharpens most cutlery including popular knife styles, kitchen scissors, poultry shears, and serrated knives. It comes with a built-in vacuum cleaning system for the debris. There is no chance of the debris ever getting into your food. The unit comes with a ceramic honing rod. 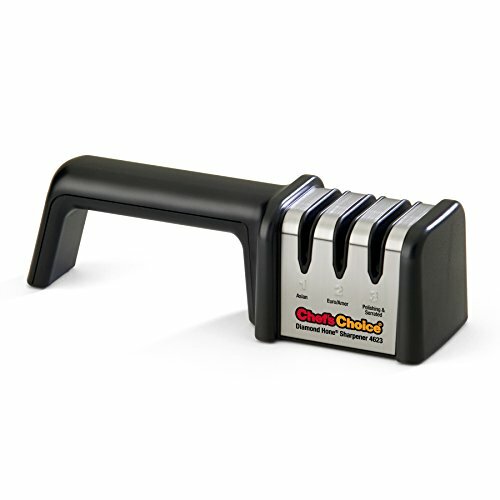 Priority Chef PCKN-03 is a reliable budget-friendly sharpener for bringing back to life dull blades. It uses a two-stage sharpening process. The device uses a two-wheel knife sharpening system and diamonds to sharpen the blade. It works for all types of blades including hard steel blades, serrated and straight edge knives. The bottom of this sharpener is designed with a cushion for gripping surfaces. In addition, it comes with a comfortable, easy grip handle. The sharpener is quite easy to use. You simply put the dull blade in the sharpening slot and get razor sharp results in seconds. The manufacturer has backed the product with a no-questions-asked 100% satisfaction guarantee refund. 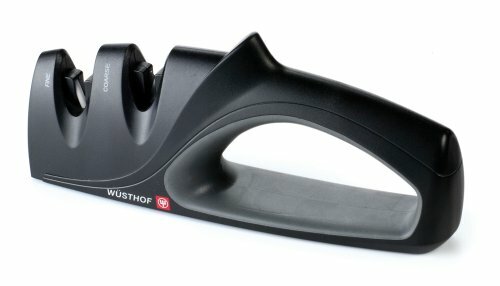 Wüsthof - 2922-7 is a simple sharpener constructed with an efficient dual sharpening system. The sharpener is quite pocket-friendly and comes with two options. You either purchase a unit with or without a bar board. The sharpener can handle serrated blades, straight edge blades and scalloped edges. It comes with an easy grip durable handle. The sharpener is small enough to be a handheld device and measures 9 by 1-1/2 by 3-1/2 inches. In addition, it comes with a rubberized base. The base has rubber mats at the bottom which gives it grip by making it stick to whichever surface it is placed therefore preventing slipping. It has a V-shaped cutting head. 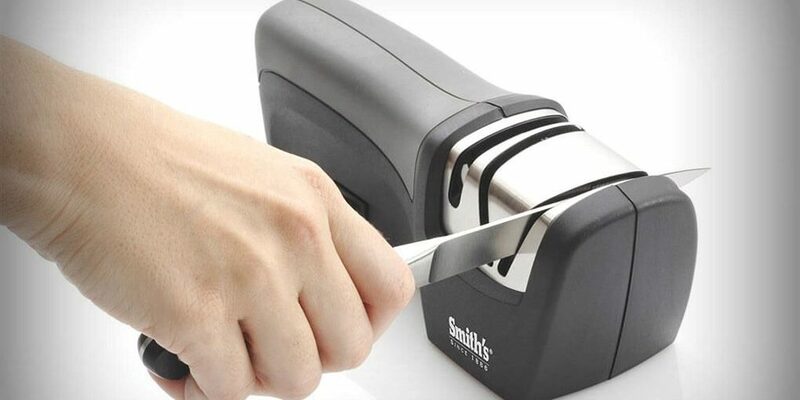 You sharpen by swiping the knife into the sharpener and pulling it out until it is sharp. The device has a carbide steel blade for the first stage of coarse sharpening. Then the machine uses fine ceramic rods for honing the knives. The first stage sharpens the blades, and then the blades are honed in the second stage. 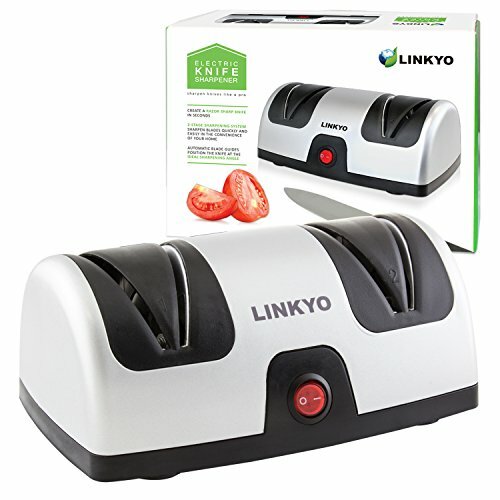 LINKYO Electric sharpener is a pocket-friendly dual process sharpener. The machine weighs 2.65 pounds, measures 8.25” x 5.75” x 3.25” and has a 3.5-foot cord. Therefore it is small and doesn’t take much kitchen space or storage space. The first stage reshapes the blade and sharpens it. Then the blade is polished and honed in the second stage. 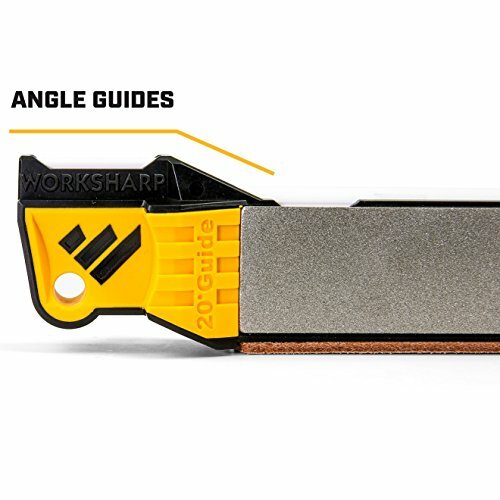 The sharpener has blade positioning guides for precision positioning. The bottom is designed with a non-slip suction for grip on surfaces. In addition, the unit comes with a built-in stop attribute to prevent damage to the blades in case too much pressure is applied. The sharpener comes with a mess-free system. It is installed with receptacles which catch metal fallings and shards. 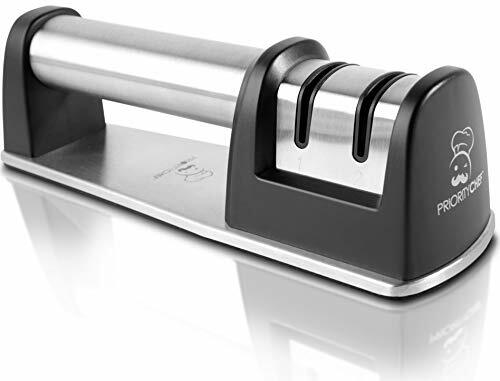 Chef's Choice M4623 is a manual sharpener with a three-stage sharpening process to give 15 degrees and 20 degrees edges. It is a perfect sharpener for both home and outdoor use. The sharpener can be used for sharpening all sorts of knives including straight edge knives, household knives, serrated knives, pocket knives, sports knives, and Santoku knives. The device has different slots for different types of knives as indicated on the body of the sharpener. The sharpener uses 100% diamond abrasives in all the three stages of sharpening. It first sharpens the blade before honing it. The result is a double beveled edge on your blade. The blade stays razor sharp for long. The device comes with an ergonomic handle, that is both left and right-hand operation. The unit is light and small and therefore easy to store. Chef’s Choice 130506 is designed for both home and professional use. It is a small device constructed with high-impact polymer and other quality materials for durability. The device sharpens both serrated and straight-edge blades. The unit measures 10 inches by 10 inches by 4 inches. The blade passes through three sharpening stages. In stage one, the blade is sharpened using 100% diamond abrasives. In stage two hardened miniature steel are used on the blades. The third stage is the honing system. An abrasive disk system is used to hone the blades to a smooth finish. The device has rubber stabilizing feet to offer a grip on any surface it is placed on. Work Sharp 09DX100 is a manual tools sharpener and compact knives sharpener. It is ideal for both indoor and outdoor use. You can use it when out camping, fishing, hunting or other outdoor uses. It can be used for sharpening kitchen knives, both straight edge and serrated blades and field tools including camp tools, and fish hooks. The unit comes fully assembled, ready to use. If you need additional features, you can modify the sharpener. You can sharpen hard to reach areas or speed up sharpening by removing the diamond plates, to use the broadhead wrench for sharpening. The device uses five abrasive steps for sharpening. They are coarse & fine diamond sharpening plates, then coarse & fine ceramic hones, & lastly a leather strop. The main downside of this sharpener is that it is powered by AA batteries, which can get expensive in the long run. It uses AA batteries which can get expensive in the long run. Don't let your hard-earned money go down the drain. Here are the essential guiding factors to always keep in mind when shopping for a high-quality tool. In order to sharpen a high-quality blade, you need to have an abrasive sharpener with you. Most affordably priced ones are mainly made from diamond. As you might be aware, diamond is one of the hardest materials known to man. Besides diamond, ceramic and carbide sharpeners exist. However, those tend to be slightly expensive than average. An easy-to-use sharpener is one that comes with an adjustable precision angle. In that case, you can simply take advantage of the guide to seamlessly position your knife for easy use. But while at it, you want to make sure that the sharpener you settle for is easy to handle even at 15-degrees. Should I Go Manual or Electric? The battle pitting manual vs electric fillet knife sharpeners has been raging for quite a few years now. But basically, you can go electric if you want to sharpener faster e.g. when you need to sharpen many knives at once. Otherwise, manual or non-electric tools are a lot safer and economical for sharpening one or two knives. Also, when you go manual, you're guaranteed of the ability to sharpen your knives even in places with no supply of electricity. So, if you're one of those people who prefer to fillet in the woods, we'd suggest going for a manual sharpener. Otherwise, if you spend most of your day filleting and are planning to increase the stock of fish you fillet soon, go for an electric sharpener. There's nothing like a perfect tool. Even the best manufacturer can mess a few things due to human or machine error. That's why it's always important to insist on warranty coverage. The question of warranty particularly applies for electric sharpeners. That's pretty much because they have complex designs and many delicate parts. We'd recommend sticking to a minimum of a 1-year warranty when going for those. As for the manual sharpening rods, you can always tell if it's defective or not when it arrives. In that case, you'd simply need to ship it back if it has serious flaws or take up the issue with the manufacturer's customer support. As far as electric sharpeners are concerned, we'd recommend the Presto 08800 EverSharp Sharpener. It comes with a 2-stage sharpening system and generally delivers awesome quality, keeping its 2-year warranty in mind. However, if you're more comfortable going for a manual sharpener, we'd vouch for the Messermeister Ceramic Rod Fillet Knife Sharpener. It's got a pretty decent level of abrasiveness and is also quite easy to use. Never let a dull filleting knife dampen your day. The good news is that as long as you have a well-made sharpener, whether electric or manual, you can have lots of fun. With that said, it's our hope that the guidelines provided above will help you maximize your money's worth.